Patents are a crucial element in moving academic research to the marketplace, where it can make a difference in the world. Without the economic protection a patent provides, there is little incentive for companies to invest time and risk large amounts of money to further develop early stage discoveries into technologies, products, or life-saving treatments. Technology for genetically modifying the herpes simplex virus to target cancer cells and induce immune response, from the laboratory of Joseph Glorioso, PhD, Professor in the Department of Microbiology and Molecular Genetics at the University of Pittsburgh. The technology has been licensed by Massachusetts-based biotech startup Oncorus. The company raised $61 million last year to develop this cancer-fighting immunotherapy. Drug treatment that reverses excessive blood vessel growth and prevents excessive wound healing known as fibrosis, which are leading causes of vision loss in patients with eye diseases such as age-related macular degeneration. The therapy is based on a discovery developed by researchers Alan Wells, MD, DMS, Thomas J. Gill III Professor of Pathology and the Executive Vice-Chairman of the Department of Pathology at the University of Pittsburgh, and Cecelia Yates, PhD, Assistant Professor, Department of Health Promotion & Development, School of Nursing, University of Pittsburgh. 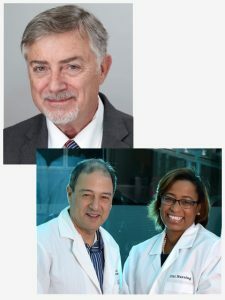 Their research into the role of antifibrotic proteins in wound healing resulted in the development of peptide fragments that can be used to prevent vision loss. The innovation was licensed to startup Ocugenix, which recently received funding from Pitt’s Innovation Works to help advance to clinical trials that could begin as soon as 2018.